This decadent gluten-free, grain-free, dairy-free, egg-free, and easily nut-free Salted Caramel Apple Pie was made once again in our house this weekend because I just had to test them out just one more time for our final week of Simply Sugar and Gluten Free’s Gluten-Free Holiday event. This week is all about everyone’s favorite part of the holidays…Desserts! 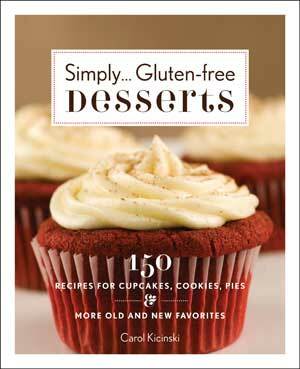 And, of course, we have a great round-up of gltuten-free, allergy-friendly goodies. This week’s host is the adorable, amazing Maggie, of She Let Them Eat Cake! She is sharing Gingerbread Cupcakes that I assure you you will want to try. They look stunning…I will be making those with the kids for sure. She also has a gift for two of you. 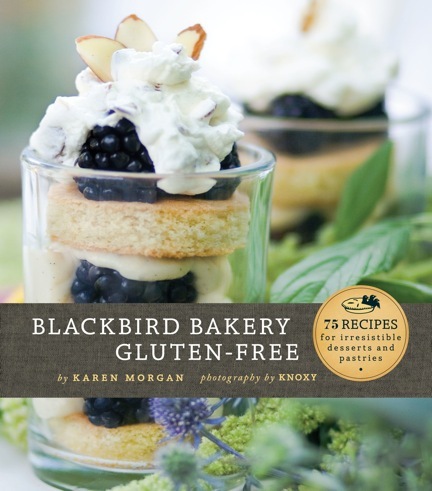 She is giving away two fabulous cookbooks. 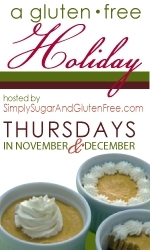 So go check them out and enter to win, and link up a favorite Holiday Dessert, if you have one! It is naughty. But only a little bit naughty. It is decadent. It is sweet. But not in a too-syrupy kind of way. It is super easy to make. It is one of my favorite indulgences this time of year. But wait. It is also a bit healthy. Well, at least healthier than a gluten-filled, grain-filled, dairy-filled version. And, if you count those 9 health benefits of apples (and just ignore the fact that they are smothered in salted caramel yumminess) then, I would go ahead and say…dig in, my friends! But, hey. The holidays are for allowing yourself a special treat here and there. So do not hate me. In fact, I dare you to make them. I think you will really love me once you do. And then you will apologize for any mean thoughts you had about me for forcing this on you. 1. You can also just make these as bars, instead of a pie, in an 8 x 8 baking dish. I actually made this in a tart pan this time. They are very versatile. 2. I use an almond flour press-in crust for the recipe, but you can EASILY make this nut-free by using the press-in cookie crust that I note at the bottom of the recipe. 3. If you are short on time and are not dairy free, Trader Joe’s has a wonderful Salted Caramel Sauce that you can use in place of this homemade sauce. 4, This recipe is a very simple one to put together. But it has an incredible WoW factor that makes it look really difficult! A good way to impress your guests. 1. For Crust: Combine all of the ingredients in bowl. With fingertips, press the dough into an 9 inch glass pie plate or tart pan. Dough should be a bit sticky. Try and bring crust up sides gently. Bake the crust at 350 degrees F for 15 minutes. Allow to cool before adding the filling. 2. For Caramel Sauce: While crust is baking, stir together coconut milk, coconut oil, brown sugar, maple syrup, and salt in a medium heavy-bottomed sauce pan. Whisk continuously and bring to a low boil over medium heat. Watch carefully – do not allow to burn! Reduce heat to medium-low and simmer gently for 3 minutes. Remove from heat and stir in vanilla extract. 3. Let cool for about 10 minutes. 4. For Filling: While caramel is cooling, toss apple slices with the juice from the lemons. In medium bowl, mix together Sugar, Cinnamon, and Sea Salt. Drain apples on paper towel, then add to sugar/cinnamon mixture. Add vanilla and toss all together. 5. Assembly: Once crust and caramel has cooled, drizzle 3 – 4 Tbsp of the cooled salted caramel sauce over the base of the crust. Then layer your apple filling evenly over the drizzle of caramel sauce. Lightly drizzle another 3 – 4 Tbsp of the salted Caramel Sauce over the top of the apples and bake in oven for 30 minutes. After 30 minutes, lightly place a piece of foil over the top of the pie, making sure the edges of the crust are under foil as well, and bake for 15 minutes more. 6. Drizzle any remaining caramel sauce over top of pie once it comes out of oven. Serve and enjoy! **NOTE**: To make a Nut-Free Crust, combine 2 cups crushed nut-free, gluten-free cookie crumbs of choice, 2 Tbsp brown sugar, 6 Tbsp Coconut Oil or Melted Butter. Mix and proceed as you would for Crust preparation in step 1 of Directions. This does just make you say “WOW” when you look at it. I am imagining it would make you say “WOW< WOW" when you taste it! Haha!! Thanks Debbie! My little 4 year old did keep saying “Yum” “Yum” as he was eating his piece last night, LOL!! I was just thinking..Is the filling a cohesive mixture or does it fall apart when cut? C A R A M E L? Where? When? How? OMG. Bathing in this. Hahaha! Laurel! That is how I feel about caramel too. Especially salted caramel! Oh my goodness…this has all my favorite treats in it! 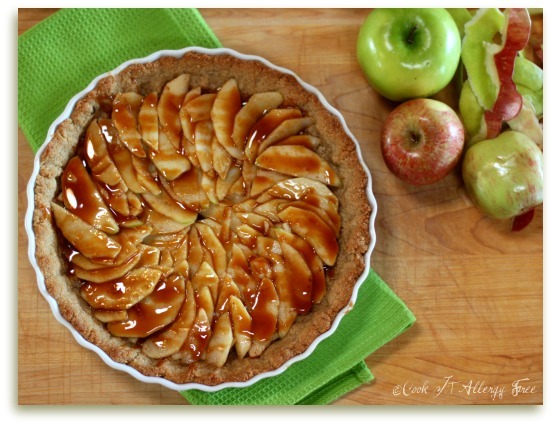 Apples and caramel were really made for each other! Absolutely beautiful and definitely on my list of things to make soon! I hope you’re feeling better! This looks wonderful. Can’t wait to try it. Apple tart of any type is a favorite. No. I think your brain is just on giveaway overload right now, Shirley! LOL No worries! Too funny! Ahh…lighting. A blogger’s friend and enemy. 🙂 Thanks Kim! Would love to win either of these cookbooks. Just a quick edit: in step number 2 of the instructions, the Caramel Sauce section (all-important!) you have accidentally listed corn syrup as one of the ingredients to include when I think you meant maple syrup. Oye! Thanks Becca! The first couple of times I made this I made it with that, but wanted to make a healthier version of it for this. Going to fix that now!! I love apples, and guess that’s why I have an intolerance towards them! But, I can handle eating something made with apples if I don’t eat it often. This recipe looks delicious! This is gorgeous! I like the idea of a bar version, and I just so happen to have a zipper bag of cookie crumbs in my freezer from last week’s experimenting (translation: fail), so I may just whip up a batch of these babies! Not sure what I did wrong, but my caramel sauce wasn’t very thick. Hi Annette! One thing you can do to thicken up the caramel is to place it into the refrigerator for about thirty minutes to an hour. If the pie crust turned out moist, it could have also been the amount of moisture in the apples. If you try to make it again at some point, I would try and drain the apples on paper towels first before layering them on top of the crust and caramel. This will help to reduce the amount of moisture that seeps into the crust. Did you use the almond flour version of the crust or the cookie crumb version of the crust, by the way? I made the Almond Meal version. I think I just figured out what I did wrong. Used 1/2 can of coconut milk, instead of 1/2 cup. Going to make it again on Tuesday and see how it turns out. Silly me. Should read instructions better. LOL! I have done that many times, even in recipes I know by heart. I hope it works better next time! Using 1/2 can of coconut milk was more like using 1 cup instead of a half a cup so that is probably why it seemed so liquid-like! Glad you figured it out, though!! 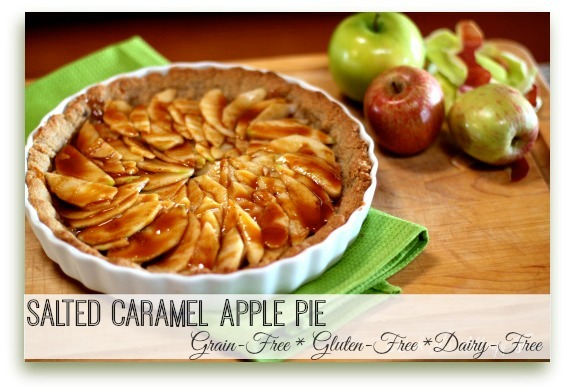 I have made this tasty gf fantastic applpie with its autiful caramel! It was sublime! So excited to make this! One question, after assembly, what temp do you bake it at? 350? It looks delicious! Thanks! Hi Haley! Yes, keep the oven at 350 degrees and you are good to go. 😉 Good luck and enjoy!